Warhammer 40,000 – I've been trying to make it out to more stores to get in pick up games lately. I've found it helps to keep things fresh. Playing at home with friends is fun but playing other places exposes me to more of what's out there. Case in point this week I played against Khorne Daemonkin, an army I know nothing about. I didn't write down my opponents exact list but he ran something like: Khorne Herald on Chariot, Bloodthirster, 2 units of cultists, 2 units of Fleshhounds, 2 units of Bloodletters, 2 units of Blood Crushers, unit of Posessed in Rhino, Defiler and three terminators. We played the Deadlock Maelstrom Mission with Dawn of War deployment. The table was an odd mismash of City Terrain, Ruins and fantasy terrain on a green grass mat. Not a pretty sight but a good spread of terrain that balanced out the field. I set up first and covered the full spread of my table anticipating him deepstriking in something in my backfield. As it turns out he instead spit his force and deployed heavy on either flank. He failed to seize the initiative so I had first turn, nightfighting was not in effect. 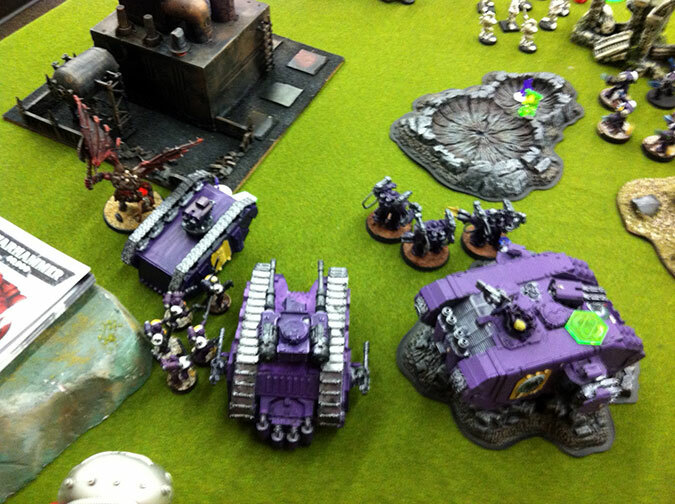 The first few turns I moved up and shot while he maneuvered around and took out my razorbacks. After getting the Crusader stuck in a crater I unloaded the Centurions who proceeded to destroy any unit they targeted. The Redwake and Company jumped out of the Redeemer to get in the fight but came up short on the charge range. Lucky for me he kept his Defiler in the back dropping templates that could seem to cause any wounds. The Bloodcrushers that destroyed the rhino died from dangerous terrain check on the charge. The Herald and Bloodthirster smash the Sicaran and pinned the tactical squad on that flank. On the other flank the Redeemer and Achilles killed a ton of stuff but I doubt they made their points back. The Techmarine just chilled in the Achilles the whole game as their were no juicy targets on his side of the table worth getting out to take care of. The game ended on turn five with a final score of 11 to 9 my loss. I didn't play to the objectives well enough during this game and fell short on a few of the kill three or more units by leaving one or two models on the board. I'm happy with the way my list worked out as the units were pretty nasty with an amazing staying power. I was however lacking in the number of shots I could put out compared to the number of units on the board. The Achilles is really cool but I'm not sure it pulls it's weight with the cannon shots.